Visitors wrote down why they thought it’s important to protect our oceans and how they planned to do so. 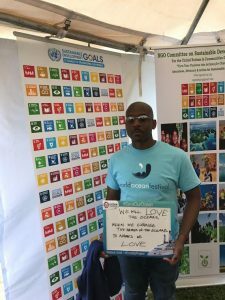 On June 4th , 2017 New York City hosted the first ever “Ocean Festival” on Governor’s Island to kick off the official Ocean Conference at the United Nations this year. 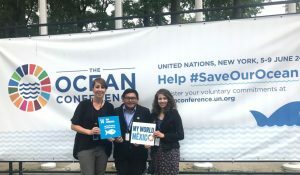 The Ocean Conference is a high level United Nations event focused on supporting the implementation of Sustainability Goal 14- conservation and sustainable use of our oceans, seas and marine resources. In support of this conference, NYC and multiple of non-profit organizations from the region, set up booths, activities, and artwork for the public to enjoy while spreading awareness about UN Sustainable Development Goal 14 and the issues involving our oceans. Along with supporting the Ocean Conference and its objectives, Peace Boat, as the first organization to make a voluntary commitment to the Ocean Conference, also unveiled its Ecoship Project to the public. Dedicated to studying the world’s oceans and marine conservation, this ship will be the world’s most environmentally sustainable cruise ship. It will set sail in 2020 and will aim to reduce CO2 emissions by 40% through energy efficiency and the use of renewable energy sources including solar and wind power. Equipped with research laboratories to study the world’s oceans and exhibition halls to showcase green maritime technologies, the ship will carry 2000 people on educational world cruises for social change every three months, taking them to parts of the world directly affected by rising sea levels and degradation of marine ecosystems. More information about the Eco-Ship was revealed on June 9th, 2017 at the Ocean Conference Side Event: “From Awareness Raising to Action for the Oceans: the role of Youth and Civil Society” in Conference Room 6 of the UN Conference Building. Our interns also worked at the booth and did a great job! 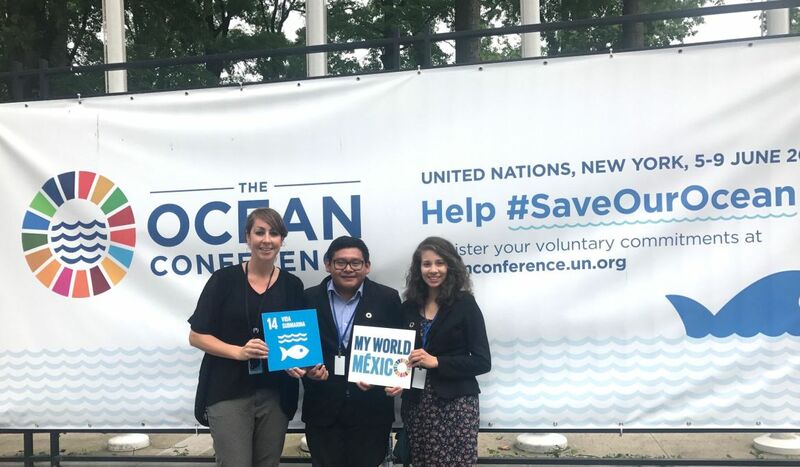 On June 8th, 2017, during the Ocean Conference at the United Nations, Peace Boat participated in the NGO Committee on Sustainable Development-NY meeting to bring together various organizations and UN representatives working to protect the oceans. Leaders from multiple fields, including business, non-profit, and science gathered together to discuss the importance of technology in maintaining safe and sustainable water and in educating young people about our oceans. Most importantly, the conference emphasized the necessity of combating climate change and global warming now, rather than later when the effects have worsened. The participants of the Sustainable Development-NY consists of entrepreneurs, scientists, humanitarians, ambassadors, and interns. The conference was co-chaired by Margo LaZaro and Yvonne O’Neal while Peace Boat US’s Director, Emilie McGlone, acted as the moderator. The keynote speakers were experts in various fields, and all emphasized the importance of clean water and preserving our planet as it is today. As stated by Ambassador and Permanent Representative of the Republic of the Vanuatu, H.E. Mr. Odo Tevi, and Professor Jan W. Dash, contaminated water is the leading cause of disease and famine, and climate change not only makes natural disasters much more severe, but also contributes to poverty and other sustainable development issues currently being tackled by the UN. It is on today’s leaders of the world to alleviate some of these issues while preparing the leaders of tomorrow to carry on the fight. Ambassador and Permanent Representative of the Republic of the Vanuatu, H.E. Odo Tevi delivers a message to preserve the waters for future generations. Various speakers provided information and statistics on climate change and other environmental issues, while other speakers presented their solutions. For example, Asi Meskin, Co-Founder and General Manager for North America Bowhead Technology, presented his interactive water bottle for kids. Alejandro Laguna presented his idea of an educational app featuring the forests and marine life of his home in South America. 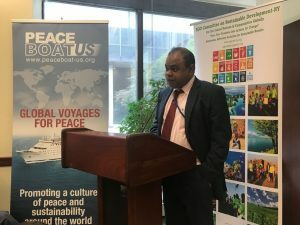 Moderator Emilie McGlone also spoke at the conference, introducing Peace Boat’s voluntary commitment to the Ocean Conference – the Ecoship project, set to sail in 2020 as the world’s first eco-friendly cruise ship, reducing its CO2 by 40%. These solutions are only a few of many, created by a community of people who understand that to preserve the planet, they need to act now or it will be too late. 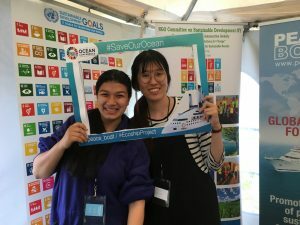 The Ocean Conference is not only a high point for this community, but also a debut to a greater effort to work towards achieving SDG #14 to conserve the oceans and marine resources. Peace Boat US Director, Emilie McGlone with the Representatives of MY World Mexico.